Our partners are just that – partners. We work with each golf property to create promotions that not only generate significant, untapped revenue, but also advance their branding objectives. We become a resource they turn to for marketing support. As part of that relationship, we share best practices and tools to help them grow their business and golfer footprint. For us, and for each of them, a true partnership through and through. As soon as you launch your UnderPar promotion, your website will see an uptick in traffic from prospective new golfers. Those site visitors will click around. They’ll look at pictures of the course, read up about your dining options, look at current tee time rates — generally “surf” your site to confirm purchasing an UnderPar voucher would be a good idea. So the last thing you want is for those new prospects to have a bad website experience. A slow site. A confusing site. Pages that are broken. Images that do a poor job of highlighting your courses best features. And if your site is not mobile optimized, they’ll likely get stuck on the homepage and won’t drill in any deeper. It’s been proven over-and-over across all major consumer and hospitality industries that a bad web experience equals lost revenue. 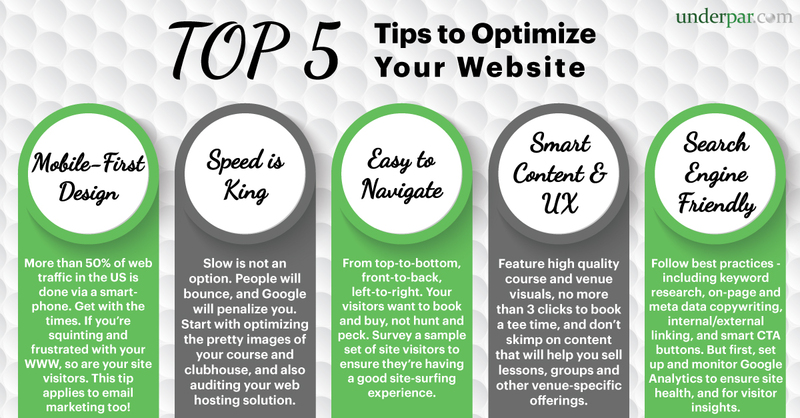 Implement our Top 5 Tips to Optimize Your Website for Bookings and Sales to ensure you don’t lose customers before you even have a chance to win them over with a great golf and customer service experience.